Even though Easter is late this year, we still have a lot of snow on PEI. Last week’s moderate temperatures (and no new snow, thankfully) saw the snow settling and starting to melt away. However, we still have plenty in stock! After such a long, arduous winter, I am so ready for spring and some color other than white snow. 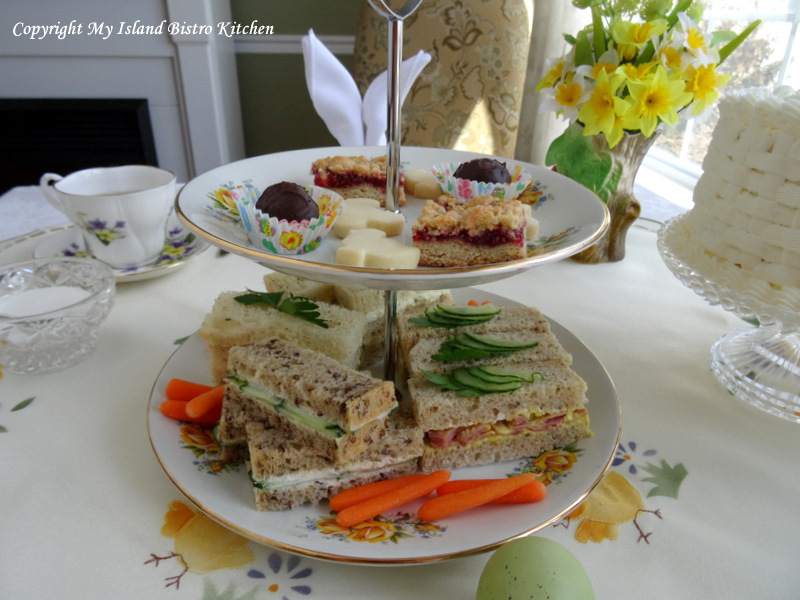 My Easter Afternoon Tea this year has yellow as its theme color. 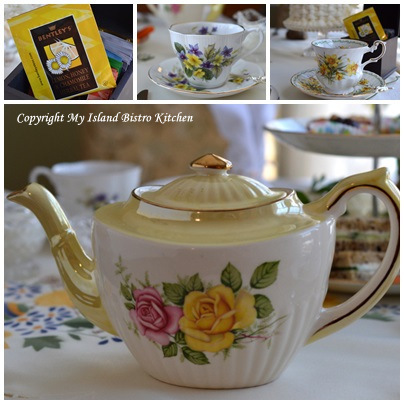 I have this Gibsons (England) vintage teapot that I have been wanting to use for a long time and its colors seem to suggest a yellow theme. I like its oval, elongated shape. I also have my Easter tablecloth square with yellow chicks and purple eggs and flowers so yellow it is with some hints of purple. I have a little growing collection of teacups and saucers. I am featuring a couple of newer acquisitions in this afternoon tea, both of them spring-themed. The first is my daffodil cup and saucer manufactured by the Rosina China Co. Ltd. in England. I love the shape and floral design on this cup including the design carried through to the inside of the cup. 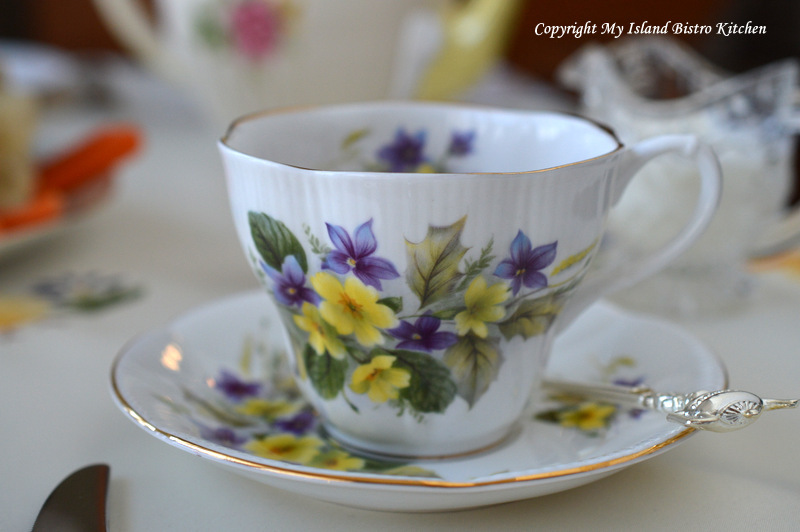 The second cup and saucer features little purple violets (one of my all-time favorite flowers) with yellow accent flowers. It’s a Royal Albert china cup and saucer and also carries the floral design to the inside of the cup. 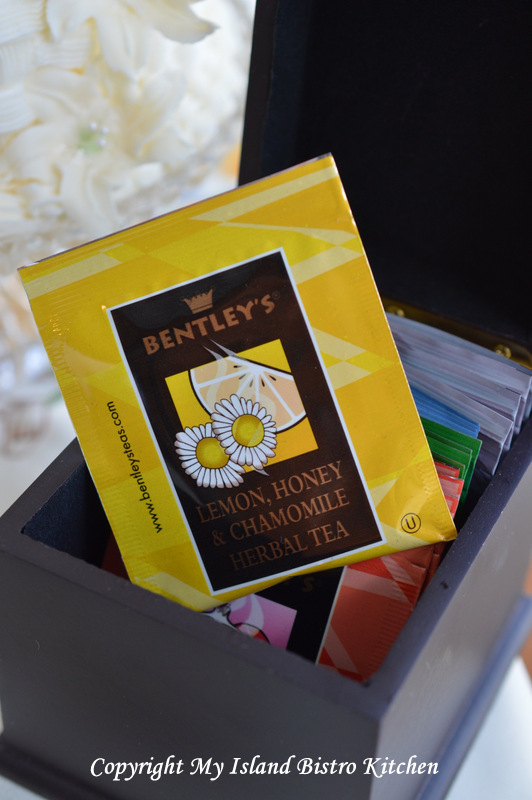 My tea selection today from my wee table-sized tea box is Bentley’s Lemon, Honey & Chamomile Herbal Tea. Yes, even the tea has a yellow cast to it, in keeping with today’s yellow color scheme! One of my grandmothers gave me this [now vintage] Withernsea England Eastgate Pottery vase when I wasn’t very old. 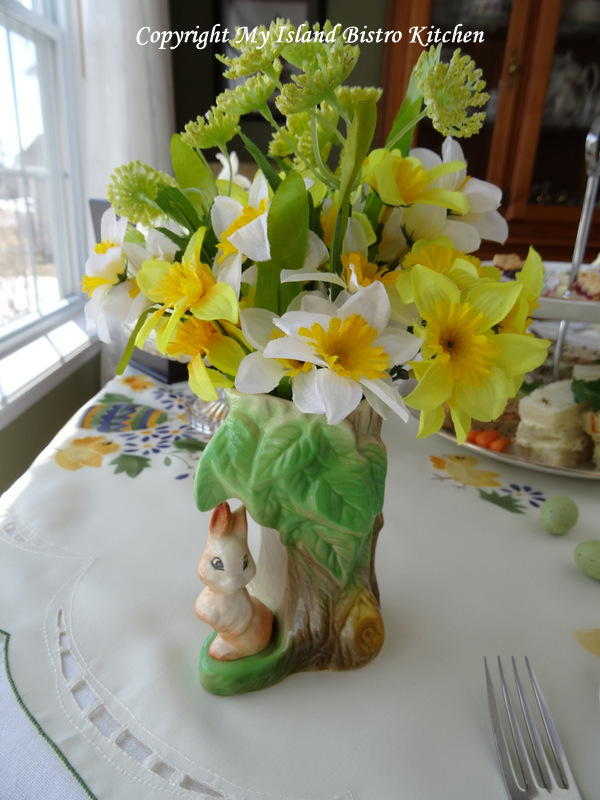 It’s now part of my Easter collection and today it holds bright yellow and white daffodils for our afternoon tea table. 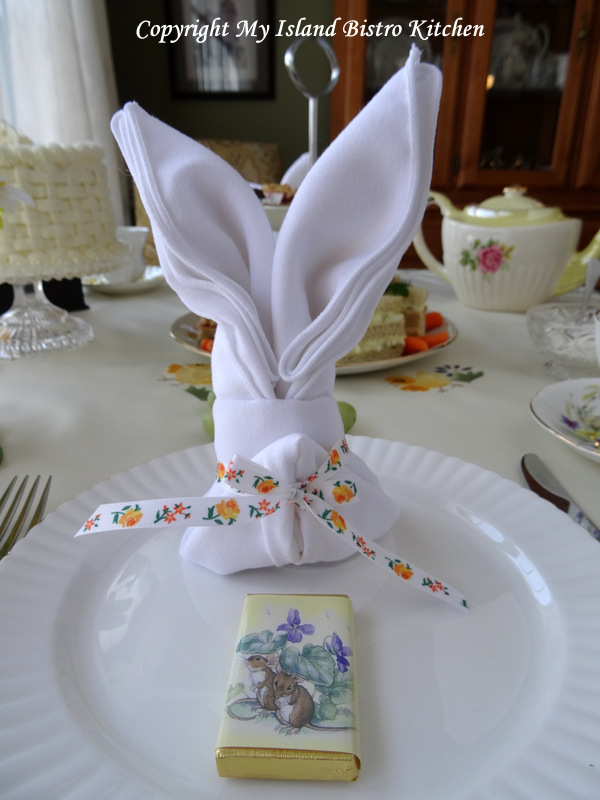 I have folded plain white napkins into bunny ear shapes for each place setting and added a chocolate to each plate because chocolate is so popular at Easter! 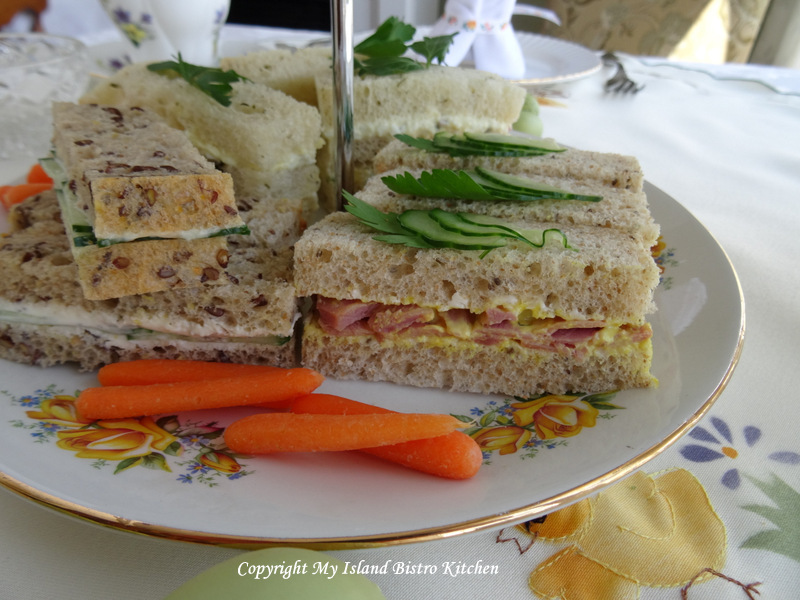 I have prepared three kinds of sandwiches for this afternoon’s tea. 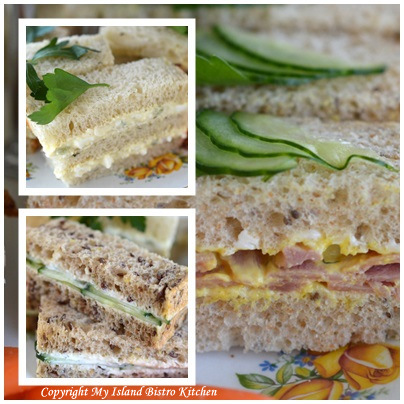 The first is a triple-decker sandwich with egg filling on potato and green onion bread. The second is honey glazed ham sandwiched between slices of Chia bread. 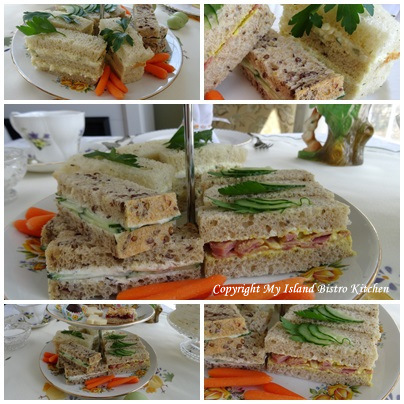 And, the third is a cucumber sandwich on flax bread. I like to use different breads on my sandwich trays, not only for their unique flavors and how well they enhance the fillings I have chosen, but also for their appearance. The old question is …. are crusts removed or left on? I think this is really a matter of preference and also how dark the crusts are. I prefer to remove them because I think the sandwiches plate more attractively if the crusts are removed. I save the crusts and make them into crumbs to use for other purposes such as the stuffing for a roasted turkey as I am not one to waste food. Even though I have a featured dessert for my Easter afternoon tea, I have included a selection of some sweets on the tiered server. A closer peek? 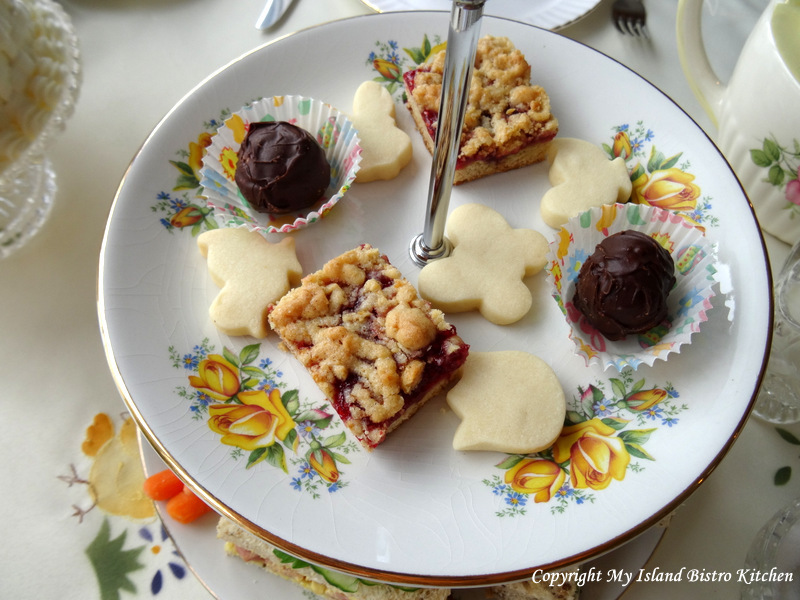 Raspberry Jam Squares, spring- and Easter-shaped shortbread, and chocolate peanut butter balls. 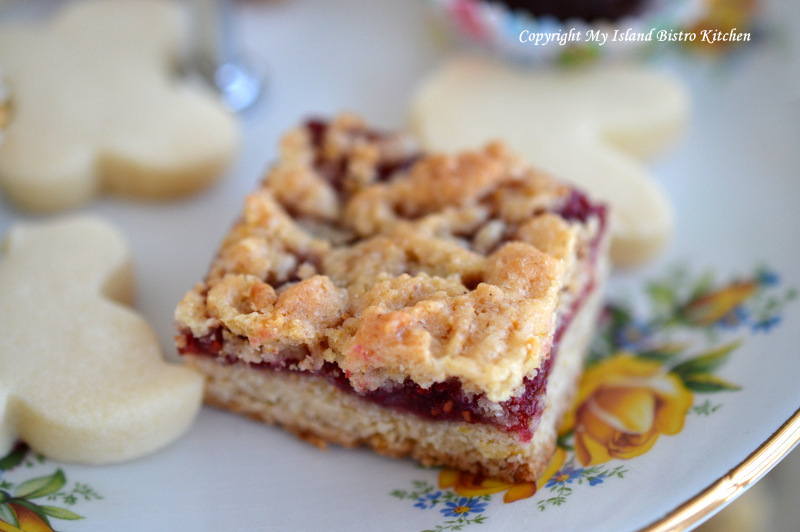 These are the jam squares I featured in my story recently about JJ Stewart Foods and Soda Company. You can get the recipe here. So, about that featured dessert …….. I like decorating cakes so I made a vanilla cake, sandwiched it together with lemon filling (keeping the yellow theme going! 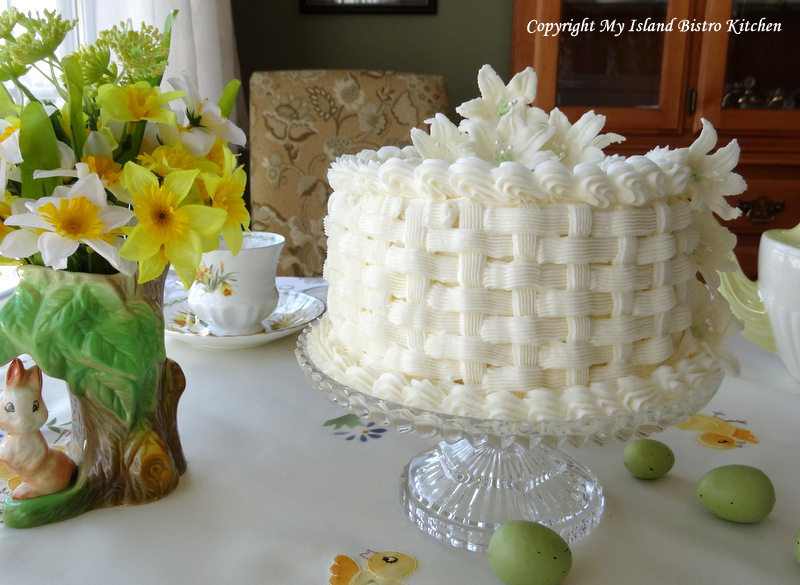 ), iced it in the basket weave design, and decorated it with sugar Easter lilies that I made with royal icing (yes, they are tedious to make and extremely fragile). Whenever possible, I like to present my decorated cakes on pedestal plates as it gives them more prominence and elegance. I hope you have enjoyed a glimpse into my Easter afternoon tea. 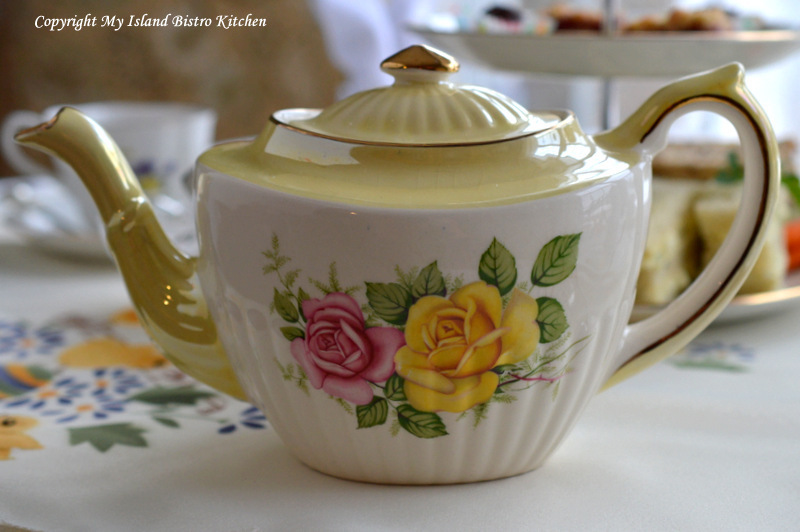 I will be joining Rose Chintz Cottage for Sandi’s Easter Tea this week. Glad you are seeing some signs towards the snow melting. 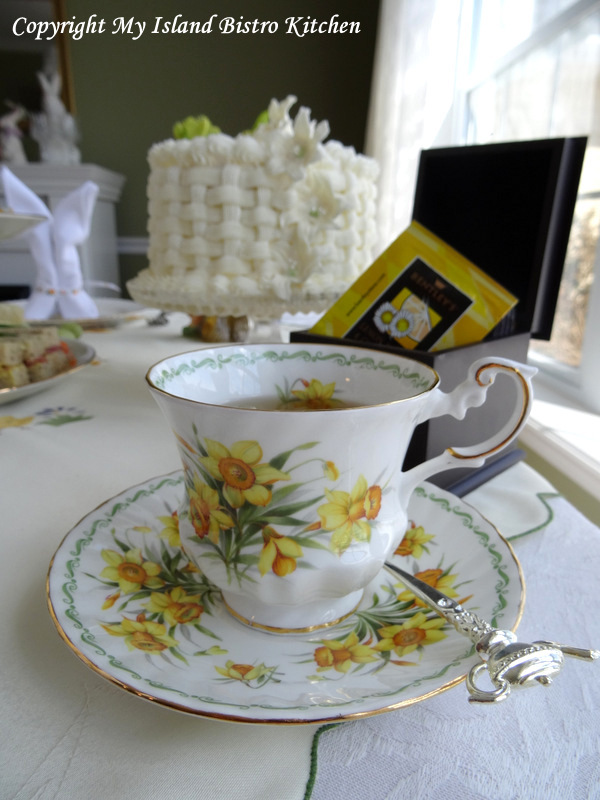 The tea party is so beautiful with all your pretty touches such as the lovely yellow oval teapot. 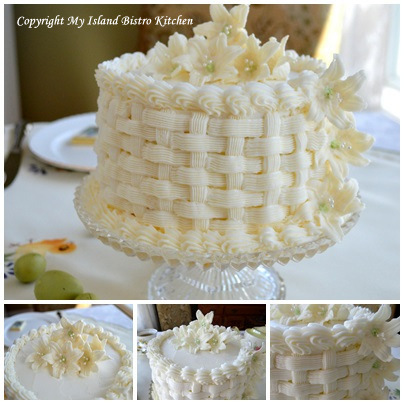 The layering of tea sandwiches look so delicious plus the basket weave cake is spectacular. Have a wonderful Easter! Thank you, Pam, for your kind words. I love the colors of Easter and springtime! All the special treats. Wish I could just pop in. Happy Easter! Love your Easter tea. 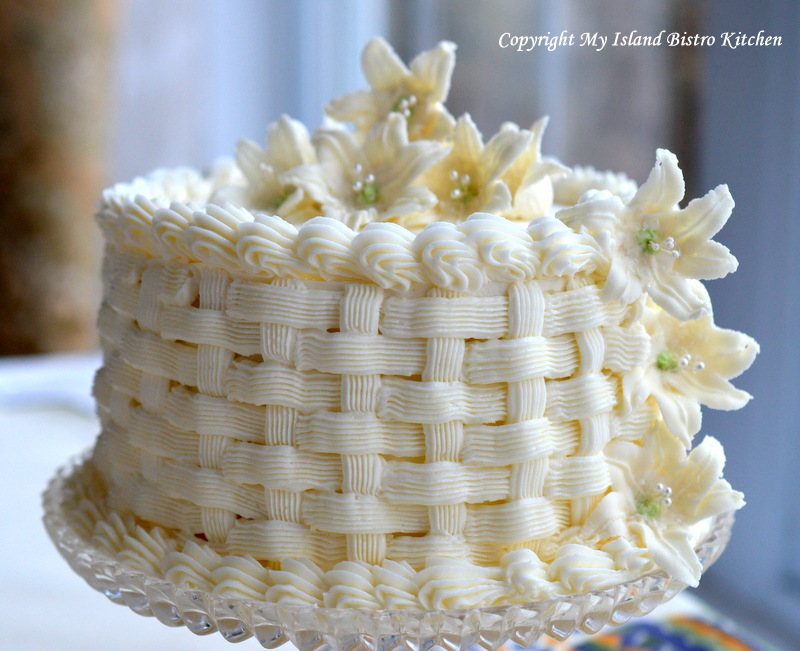 Your basketweave cake looks so lovely and delicious. I haven’t made one in ages since I took cake decorating classes. Thanks for inspiring me, I will have to pull out my tips! 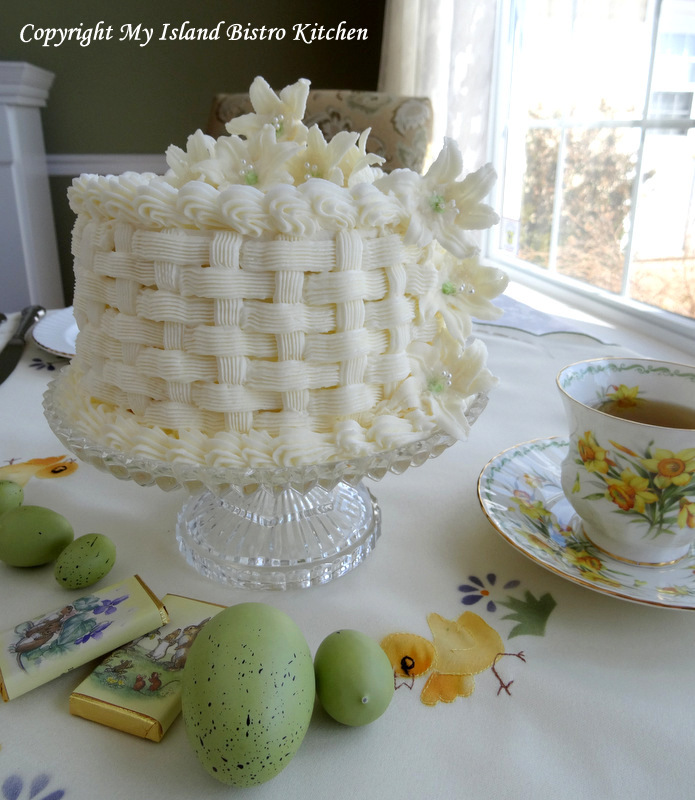 Such a lovely Tea and your cake is just amazing- so glad I stumbled on your blog! Your cake is beautiful! The tea looks delicious and I love the bunny planter. I have that same daffodil cup and saucer :).